Is there a more attractive stock to buy right now than China Mobile (CHL)? If there is I’d love to hear about it… seriously! I first wrote about how attractive I thought shares of China Mobile were at the start of October. Since then, the stock has outperformed the S&P 500 by more than 13 percent. But I still think it is a table-pounding buy! Let me lay out my investment case today for China Mobile in what I think are 4 very convincing reasons. Then you can decide if you agree with me on how attractive China Mobile’s shares are today. There are but a handful of companies on this planet that have a balance sheet that can rival China Mobile’s. Currently, China Mobile is sitting on $60 billion of cash and has no long term debt. Perhaps that already juicy current dividend of 4 percent should be increased rather than letting that $60 billion cash hoard continue to build? China Mobile has the ultimate business moat. The Chinese government legally protects the company from competition. Because the majority of China Mobile’s shares are owned by China Mobile Communications, which is a state-owned entity. That means China Mobile’s shareholders are partners with the Chinese government, which provides some huge competitive advantages. The main advantage is that it limits competition. 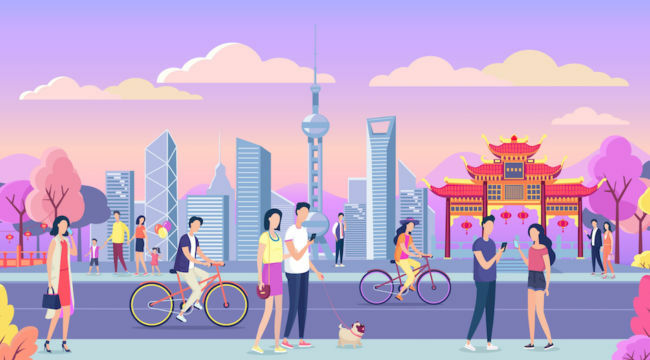 Today, China Mobile has over 900 million subscribers. That is nearly a billion people! The next-largest competitor in China, China Unicom (also controlled by the government), has 190 million subscribers — only 20% of China Mobile’s count. Telecommunications is a key pillar of the Chinese economy, and the Chinese government wants its state-backed enterprises to succeed. There is zero chance that China Mobile will soon be facing the kind of profitability-crushing price wars that U.S. competitors like AT&T and Verizon are forced to endure. In other words, China Mobile’s competitive moat is filled with sharks, alligators, killer whales and a few other terrifying creatures that protect its business from competition. 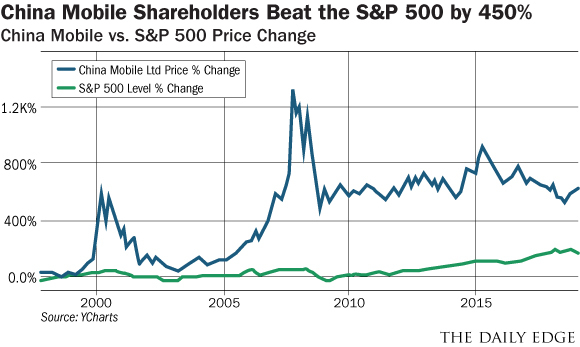 And if you think being partners with the Chinese government is a bad thing, I’d take a look at how China Mobile shareholders have done over the past twenty years versus the S&P 500. Telecommunications companies have become the new consumer staples businesses of the world. Today, people would rather give up their toothpaste and shampoo before giving up their smartphones or Wi-Fi connections. That means the telecommunications industry is going to have pricing power over the long-term. Clearly over time telecommunications providers in China are going to be able to steadily increase rates the company charges consumers which will continue to drive revenue and earnings growth. The shares of China Mobile are absurdly cheap. And when you factor in the balance sheet, this current valuation gets even better. At the current share price, China Mobile shares trade for just 2.98 times enterprise value to EBITDA. That is crazy!! What that valuation means is that it will only take China Mobile 2.98 years to generate EBITDA (essentially cash flow) that is equal to the entire valuation of the company at the current share price. This valuation would be like a bond yielding 33.5 percent. Or buying a rental property for $300,000 and renting it out for $100,000 per year! 2.98 times EBITDA would be incredibly cheap for a small cap company with no competitive moat. Let me tell you that China Mobile, with 900 million subscribers and $60 billion of cash, is no small cap company lacking a competitive moat. For some additional perspective, consider that the industry median valuation for telecommunications providers is 8.29 times. That means that the average company in this industry trades at almost three times the valuation of China Mobile — despite those average companies having inferior balance sheets, operating in a more competitive market, and offering far less growth potential. Can you see why I’m having a hard time finding a more attractive stock market opportunity than this? 3Average Cell Phone Bill Now Over $80 per Month!